The solar system as we know it formed about 4.6 billion years ago as fields of interstellar dust orbiting the sun aggregated into planets and smaller objects. Presolar dust particles no longer exist in the inner solar system, as they were long ago destroyed, reformed, and reaggregated in multiple phases. From the vantage of such a long period of time, astronomers can only make inferences about its composition and the processes that led to the solar system's present configuration, bringing to bear advanced instruments on Earth, in orbit, and in deep space to collect evidence. Presolar dust is distributed by comets throughout the solar system, and ground-based analysis of cometary comas has revealed that this dust contains so-called GEMS, an acronym for glass with embedded metal and sulfides, believed to be carbon-free. And some have isotopically anomalous a-silicate components that could only have originated at other stars, which means that they comprise preserved samples of the interstellar medium. Now, a multi-institutional collaborative of researchers has published a study drawing multiple inferences about the nature of presolar dust based on these observations, as well as data gathered from the Cosmic Dust Analyzer (CDA) aboard the Cassini Saturn orbiter during its two-decade mission; in their paper, published in the Proceedings of the National Academy of Sciences, they present a detailed description of presolar dust aggregation that fits the new data. They start by proposing that GEMS formed within the interstellar medium via grain shattering, amorphization and erosion from supernovae shocks, and experienced subsequent periods of aggregation. "With repeated cycling in and out of cold molecular clouds, mantled dust and any aggregates were repeatedly and progressively partially destroyed and reformed. Cassini mission data suggest the presence of iron metal in contemporary interstellar dust," the researchers write. They believe irradiation within the interstellar medium provided enough energy to incorporate small amounts of metal atoms within the amorphous silicates comprising the dust. 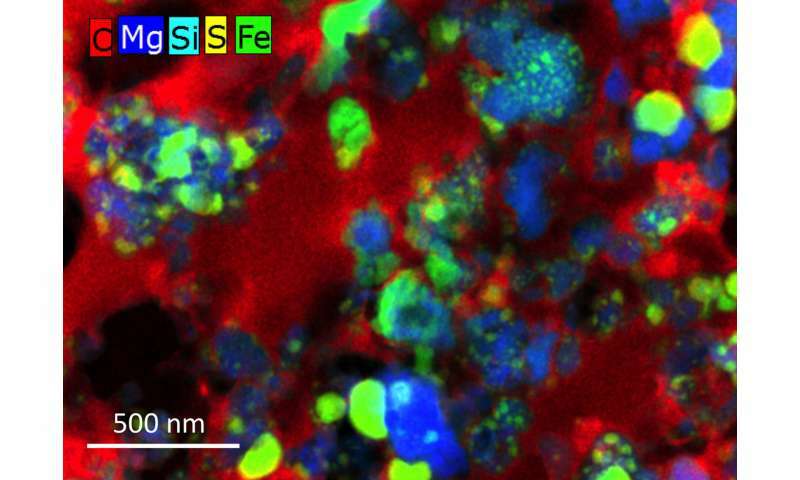 After the collapse of the presolar molecular cloud, these first-generation metal-impregnated GEMS aggregated with crystalline grains that were likely transported from the hot inner-solar nebula, creating second-generation aggregates, which were then likely incorporated into small, icy cometary bodies. "We suggest the second aggregation occurred in the outer regions of the collapsing cloud or young protoplanetary disk subsequent to silicate condensation at high temperatures," they write. The researchers note that the complex organics in the ice-mantled grains must have experienced a high-radiation environment before incorporation into larger bodies, which may have resulted from vertical diffusion of dust above the solar system's mid-plane. The researchers conclude by noting that their picture is incomplete, and much of the data is still rough—for instance, the elemental composition of GEMS sometimes only matches the solar elemental composition collectively, exhibiting chemical anomalies at higher resolution. But they believe they have provided constraints on solar system development and the aggregation of presolar dust that will inform future studies, observations and models. The solar system formed from interstellar dust and gas in a molecular cloud. 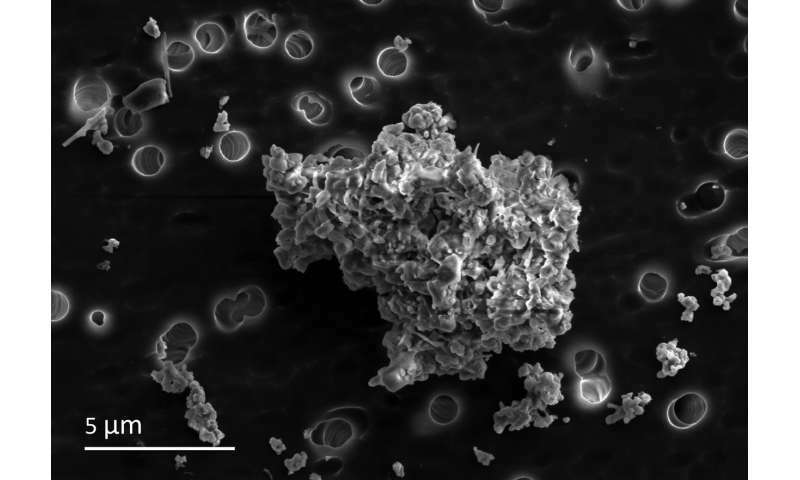 Astronomical observations show that typical interstellar dust consists of amorphous (a-) silicate and organic carbon. Bona fide physical samples for laboratory studies would yield unprecedented insight about solar system formation, but they were largely destroyed. The most likely repositories of surviving presolar dust are the least altered extraterrestrial materials, interplanetary dust particles (IDPs) with probable cometary origins. Cometary IDPs contain abundant submicron a-silicate grains called GEMS (glass with embedded metal and sulfides), believed to be carbon-free. Some have detectable isotopically anomalous a-silicate components from other stars, proving they are preserved dust inherited from the interstellar medium. However, it is debated whether the majority of GEMS predate the solar system or formed in the solar nebula by condensation of high-temperature (>1,300 K) gas. Here, we map IDP compositions with single nanometer-scale resolution and find that GEMS contain organic carbon. Mapping reveals two generations of grain aggregation, the key process in growth from dust grains to planetesimals, mediated by carbon. GEMS grains, some with a-silicate subgrains mantled by organic carbon, comprise the earliest generation of aggregates. These aggregates (and other grains) are encapsulated in lower-density organic carbon matrix, indicating a second generation of aggregation. Since this organic carbon thermally decomposes above ∼450 K, GEMS cannot have accreted in the hot solar nebula, and formed, instead, in the cold presolar molecular cloud and/or outer protoplanetary disk. We suggest that GEMS are consistent with surviving interstellar dust, condensed in situ, and cycled through multiple molecular clouds. A-Hah! My suspicions are confirmed. The creator godlings were giant space-going dust-bunnies!